The two major types of headaches are primary headaches, which are not associated with the underlying medical condition, and secondary headaches, which are caused by an underlying illness, such as brain pathology, ENT or Opthal problem. Primary headaches include tension, migraine and cluster headaches. Migraine is a condition that causes attacks (Episodes) of intense, throbbing pain, often on one side of the head. Nausea, vomiting and sensitivity to light (Photophobia), sound (Phonophobia) and exertion often accompany migraines, which can last several hours or up to three days. Some migraine sufferers experience a visual disturbance called an aura prior to the onset of the migraine. Auras are flashing lights, wavy lines, blurry vision or blind spots. The headache is usually on one side of the head, typically at the front or side. Sometimes it is on both sides of the head Sometimes it starts on one side, and then spreads all over the head The pain is moderate or severe and is often described as throbbing or pulsating Movements of the head may make it worse It often begins in the morning, but may begin at any time of the day or night Typically, it gradually gets worse and peaks after 2-12 hours, then gradually eases off However, it can last from 4 to 72 hours. Other migraine symptoms like nausea, vomiting, Photophobia and Phonophobia are common. About 1 in 4 people with migraine have migraine with aura. The symptoms are the same as those migraine without aura, but also include a warning sign (an aura) before the headache begins. Symptoms of a tension headache include pressure and a band-like tightness that begins in the back of the head and upper neck, and gradually encircles the head. 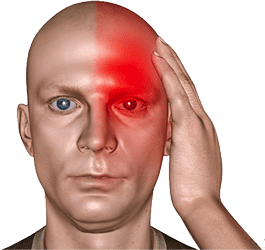 Cluster headaches are headaches that occur in groups, or clusters, over a period of several weeks or months separated by headache-free periods of months or years. During the headache period, the cluster headache sufferer experiences several episodes of pain during the day, each of which lasts 30 to 90 minutes. 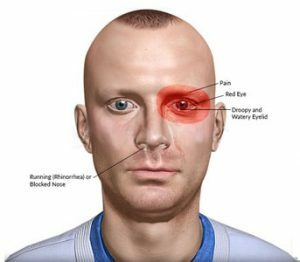 These attacks, which often occur at the same time of day, include sharp, penetrating pain around or behind one eye, watering of the eye and a stuffy nose.